Jim Schaap reads "Just Another Cross-Cultural Mess"
Old Elizabeth--she picked up a white woman's name--never heard of Susan B. Anthony. Couldn't have. She didn't know English, knew nothing about a right to vote. But that didn't mean she wasn't a feminist. No sir and no ma'am. Old Elizabeth had little to do with men, but a lot to say. Outspoken? Yes, on all things gender-related. Opinionated?—you bet. She flat out didn't like men. Could be argued she had cause. Corabelle Fellows says old Elizabeth had "merry eyes and many chins." She may not have been an American Beauty rose. 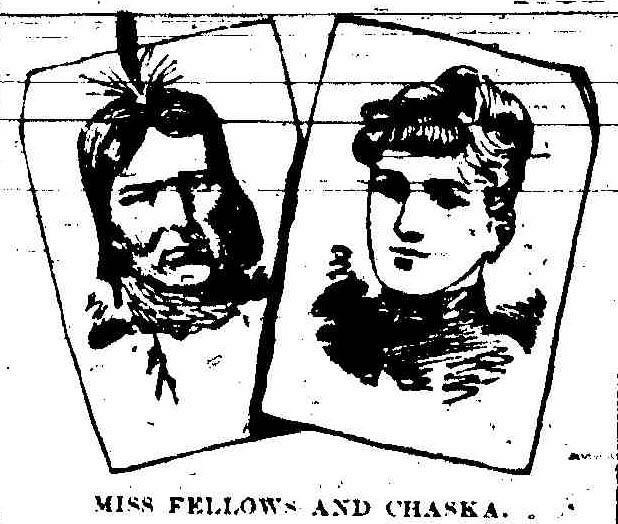 She was, Miss Fellows says, an "old-maid Indian,” left out by her band, who had, Miss Fellows says, the unpleasant tradition of putting women of forty winters out of the village if they'd never married. This feminist Lakota woman was her host when Corabelle arrived on the Cheyenne River Reservation to teach school. Old Elizabeth offered her a place in her log cabin, nicely furnished, lacking little--well, running water you had to run for, but who knew anything about faucets? Old Elizabeth held strong opinions about men, which made Miss Fellows' English night school for men--they met at Elizabeth's place--something of a trial for the old woman. No matter. In the one-room cabin, Old Elizabeth lay right there beside the class and slept—out loud too. Three men--Miss Fellows calls them "boys"--brought along a friend one night, who carried a white doeskin blanket, but never said a word. Miss Fellows says she couldn't take her eyes off that "pure white gleaming doeskin, entirely unornamented," so she describes it in her memoir Blue Star. For weeks, Old Elizabeth had warned Miss Fellows not to go out by herself after dark. But that night, with her landlady sawing wood, she stepped out and was, in a flash, "seized by strong arms, wrapped tightly in a white doeskin blanket, and borne swiftly away by noiseless feet." Finally, she says, her captor dropped her in a snowbank. Corabelle Fellows had spent a couple of years teaching at the Santee Reservation before moving to Cheyenne River, but being grabbed in the darkness was terrifying. Even in a snowbank, her nerves were fried. Oh, my word, did old Elizabeth get mad! The old woman chugged down the same path towards the river in the dark and found poor shaken Miss Fellows, then half-dragged, half-carried her back home, boiling hot like stew over an open fire. Miss Fellows claims her nose about quit functioning in the stink put up by the horrid concoction the old woman started brewing on the stove, a foul repellent to keep men away, Old Elizabeth said. Two hours it took before either of them could settle down--Corabelle from bone-chilling terror, old Elizabeth from flat-out rage. At Corabelle. That's right. Old Elizabeth blew a gasket because Miss Fellows had left the cabin alone and thereby just about given herself away to the guy with the doeskin blanket. She'd done everything that man hoped she would: she'd asked him to speak, looked at him fondly, then left the cabin alone just after he did. Old Elizabeth let Miss Fellows know she was acting like a cheap hussy. Out there on the Cheyenne River Reservation that night, two women--one young and white, the other old and Lakota--got it all decidedly wrong, the blind leading the blind. Corabelle had no idea of Lakota ways; Old Elizabeth had no idea her boarder had no idea. That's the delightful story Corabelle Fellows tells in Blue Star. That night, both proved idiots. Once that was understood, Old Elizabeth quit stirring that stinkpot, and the two of them laughed. And laughed. And laughed. Which is where all such stories should end, don't you think? Corabelle even kissed old Elizabeth, something that just wasn't done on the reservation. If you're a man, don't go feeling sorry for the poor guy with pretty white doeskin. That night, he went home empty-handed, but he didn't go back to an empty tipi. He already had several wives. I think all's well that ends well. Support for Small Wonders on Siouxland Public Media comes from the Daniels Osborn Law Firm in the Ho Chunk Centre in downtown Sioux City, serving needs of clients in real estate transactions; business formation and guidance; and personal estate planning. More information is available on Facebook or at danielsosborn.com. It’s the summer of 1971, on Highway 34, southwest Iowa. Some big digger, a lumbering monster doing the dirt work for road construction--maybe they were going to widen the highway—chewed up ground as such monsters do so well. But it stopped, politely, at the graves of 28 people it found in the way. You can’t just go charging through. Some kind of recovery had to be done. One of the men running the show, a man named John Pearson, came home that night after work with the news. If you can take I-90, west, most people think you’d be downright crazy taking Highway 18, a meandering two-lane-r that slows through small towns you’d never otherwise notice. Highway 18 barely deserves the word highway. But if you’re crazy enough to wander and you have the time, you could do worse than score a big sky sunset some late afternoon over Hwy. 18. It’ll take you through endless reservation lands, two of them—the Rosebud and Pine Ridge—side by side in the lower echelon of west river South Dakota counties. Her father doesn’t ask her consent, but promises his greatly-admired daughter to the old warrior anyway, despite her silent protest. Many years separate the girl from the man she is bound to marry, and secretly—her parents know nothing of it—she had promised herself already to a young warrior from the village. All of that is the first act of this somehow familiar drama. What it clearly suggests is an ancient human conflict: love versus community, tradition, and family. This version belongs to Omaha lore. Up to seven nights a week at a local gym in Sioux City, you can find a basketball group calling themselves The Midnight Ballers. Players from different cites, states, and even countries unite through their love of the game.